WAIST HIGH: Bruce Foxton Reunites With Paul Weller. Bruce Foxton Reunites With Paul Weller. Bruce Foxton has reunited with Paul Weller to play two songs on Weller’s new album Wake Up The Nation, "Fast Car Slow Traffic," and "She Speaks." This news is kind of a BIG DEAL because Foxton and Weller have not recorded together since a bitter 1982 falling out over The Jam related royalties. 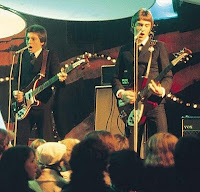 Jam drummer Rick Buckler and Bruce Foxton formed From The Jam in 2007 without Weller, who at one time stated that he and his "children would have to be destitute and starving in the gutter" for him to front the band once again. Buckler left From The Jam in late 2009 and was replaced by Mark Brzezicki (Big Country), and according to From The Jam's Official Facebook Page, Brzezicki, Foxton, and vocalist Russell Hastings are preparing to head into the studio to record some new material. Paul Weller admits it took the deaths of his father John and Foxton's wife Pat to bring them together. Weller told MOJO magazine, "We'd both lost loved ones and without getting too spiritual that was the spur of it. I spoke to him...when his wife Pat was ill and that broke the ice... There was no big plan, it was easy, a laugh, and nice to see him and work together again. We just slipped back into it."